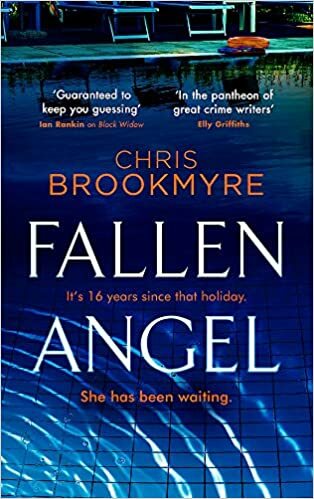 I found the prologue to Fallen Angle by Chris Brookmyre, AKA Christopher Brookmyre, intriguing if slightly puzzling. After that we meet Ivy who I found a little weird. Then there is Amanda who has arrived in Scotland for the summer before she goes to university and seems to be a nanny on the cheap. After her there is Celia an older lady who was famous and whose famous academic husband, Max, has just died. From here on we meet other members of Celia’s family who are going to Portugal for a family meet up. A grandchild of hers died their in 2002. The story switches between 2002 and 2018 and looks at various people’s stories. I found I was around 20% in before the story really started to make sense. Once that had happened I thought this might be quite a simple story about a family tragedy in 2002. In some senses this is the case however it isn’t quite just that. Max, now deceased, was a well known debunker of conspiracy theories in his lifetime. Are there conspiracies theories about the death in 2002? Of course there are! But nothing is ever that simple. When the revelations they are powerful ones (and may disturb some). Parts of this I actually really enjoyed particularly towards the end. The last 20% will not be left unread by many! I guess the characters are not bad. Amanda and maybe Ivy are quite interesting. However even the best of the characters are somewhat unlikeable. The less good characters are even worse! This is well written as I would expect from this author. The story isn’t bad though nothing like the author’s best for me. For me it was hard to get over the fact that I simply didn’t like anyone involved in the story. Equally the final twist was probably a little much for me. I do love Brookmyre’s work generally however this is not a highpoint. It will not stop me reading future books by him though. I’ve read and reviewed a number of previous book by this author – the review of the last one which I enjoyed far more is here.